Annie Elizabeth is a well-known traditional English "cooker". The flavour is sweeter than most culinary varieties, and it can also be eaten if you like a sharp apple. The apples are usefully large, and it is a good keeper. This is a good variety for any recipe where you want slices to keep their shape when cooked. Please fill in the details below and we will let you know when Annie Elizabeth apple trees are back in stock. Bountiful is an easy-to-grow cooking apple, it retains its shape when cooked, fairly sweet for a cooker. 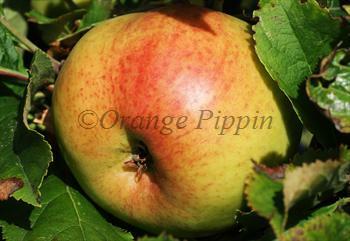 Charles Ross is a very attractive classic English dual-purpose apple. Cold hardiness: 10F / -12C? Annie Elizabeth is in flowering group 4. Annie Elizabeth is partially self-fertile, but fruiting will be improved if there is a compatible tree of a different variety nearby. Like many traditional cooking apples, Annie Elizabeth is reliable and easy to grow. It can be grown throughout the UK and is usually unaffected by pests and diseases. Although usually considered as a partially self-fertile variety, Annie Elizabeth nevertheless has many of the hallmarks of a (self-sterile) triploid variety - good disease resistance, vigorous growth, and thick dark-coloured leaves. For this reason it is perhaps best planted with another compatible (different) variety nearby. Raised in Leicestershire in the mid 19th century and introduced by the Harrison and Sons nursery of Leicester.